The Finger Lakes winery chooses a local comfort care home for their Year of Giving campaign. 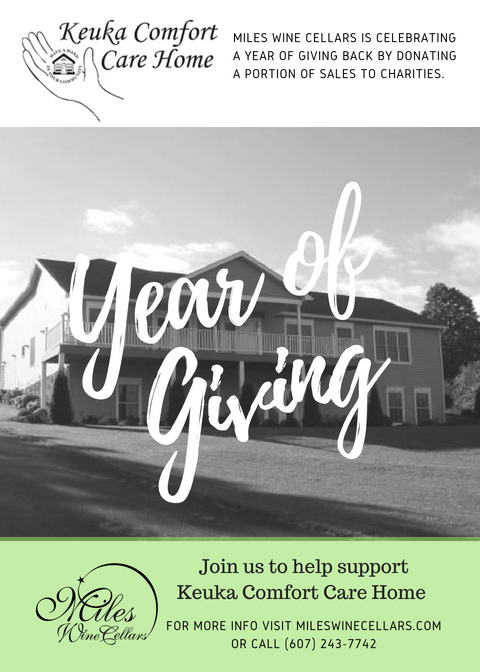 During the month of July, Miles Wine Cellars in the Finger Lakes spotlights Keuka Comfort Care Home for their Year of Giving Campaign. Miles Wine Cellars will raise awareness and donate a portion of their sales to Keuka Comfort Care, which is celebrating its 10th year. During July Miles Wine Cellars is donating a portion of sales to Keuka Comfort Care. This is part of the winery’s Year of Giving campaign, which has been successful for raising funds and awareness for charities and causes close to the owners’ heart. Located on the pristine shores of Seneca Lake, Miles Wine Cellars features award winning Finger Lakes wine, beers, as well as, a seasonal boathouse and year-round inn.